Whether paprika from Spain, pepper from India and Vietnam or cinnamon from Madagascar, Old Mansion Foods based in Petersburg, Va., has been manufacturing and developing dry spices, seasonings, breadings, dry mixes, coffee and teas since 1877. Old Mansion imports and processes spices in bulk with extensive packaging options to include private labeling of custom blends for institutional, food service, restaurants and chain companies. With its location in central Virginia only a few hours away from Norfolk’s port, Old Mansion offers multiple capabilities and warehousing opportunities for its customers’ spice, seasoning, breading and dry mix needs. The company’s 137,000-sq.-ft. headquarters includes a pristine test kitchen for research and development as well as a quality assurance laboratory to ensure product safety and satisfaction. Old Mansion adheres to FSMA regulations and global food safety standards and enforces strict sanitation practices with Good Manufacturing Processes (GMPs). Company officials wanted to make a metal detector a key part of the company’s Food Safety Plan. “Having a metal detector in your plant is no longer a luxury, it is critical in operations to eliminate food safety hazards and essential for food safety,” explains Dale Patton, owner of Old Mansion Foods. Laura Palombo, manager of quality assurance, wanted a metal detector that would enable faster set-up, less downtime and be user-friendly. “While I am a very hands-on person, I did not want to be the only person to monitor the unit. I expected our other staff to operate the metal detector and be able to report any issues,” she says. After a meeting with Eriez technicians and sales representative Drew Harris of Dominion-Carolina Sales, Old Mansion participated in an online demonstration and product test at the central test lab of Eriez Manufacturing Co. in Erie, Pa. They watched their own ingredients running through an Eriez Xtreme Metal Detector, which is specially designed to detect small metal contaminants. The Xtreme Metal Detector features a user-friendly interface that is ETL/CSA/CE approved. It incorporates a dedicated reject log and event log, which is essential when Old Mansion runs various ingredients at interval periods through the detector, according to management. The Enhanced Platform (EP) technology is a breakthrough method used for the toughest food applications. The most difficult products for metal detectors to analyze are those that create a significant signal in the balanced field, which is known as product or bulk effect. The Xtreme Metal Detector is able to locate metal within ingredients such as paprika and black pepper which, because of their agricultural consistency and mineral content, can make it very difficult. 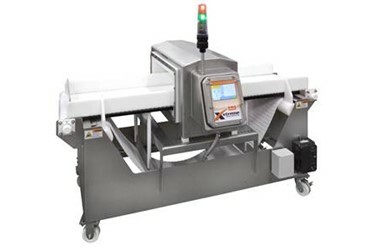 The Xtreme Metal Detector offers greater sensitivity with its multiple frequency range, vibration immunity and unique ability to statistically regulate product effect. Many configurable inputs and outputs enable easy installation and give customers the ability to add multiple options. The Old Mansion quality control staff keeps detailed reports for each production run and retention samples for laboratory evaluation. The quality control team also approves all products prior to shipment. That means the Xtreme Metal Detector is a very critical step in the food safety plan to ensure product release. Now, more than a million pounds a month of select spices are inspected by six Xtreme Metal Detectors.